Carl Maria Friedrich Ernst, Freiherr von Weber (November 18, 1786 – June 5, 1826) was a German composer. Carl Maria von Weber's work, especially in musical theatre, greatly influenced the development of the Romantic opera in German music and influenced the early work of Richard Wagner. While an innovative composer for the clarinet, for which he wrote many works, his body of Catholic religious music was highly popular in nineteenth century Germany. Additionally, Weber also wrote music journalism and was interested in folksong, and learned lithography to engrave his own works. Carl Maria von Weber's reformation of German operatic stylism centered in the production aspects of the stage presentation as well as giving more attention to the orchestra rather than the singers and chorus. His tendency to compose for colorful and emotional orchestral segments would tell the theatrical story by the orchestra which complemented what was happening on stage. He discovered a true musical partnership between the singers and the orchestra demonstrating that no one existed in isolation from one another but co-existed in mutually fulfilling situations. Weber was the eldest of the three children of Franz Anton von Weber (who seems to have had no real claim to a "von" denoting nobility), and his second wife, Genovefa Brenner, an actress. Franz Anton started his career as a military officer in the service of the Duchy of Holstein; later he held a number of musical directorships, and in 1787 he went on to Hamburg, where he founded a theatrical company. Weber's cousin Constanze was the wife of Wolfgang Amadeus Mozart. Weber's father gave him a comprehensive education, which was however interrupted by the family's constant moves. In 1796, Weber continued his musical education in Hildburghausen, where he was instructed by the oboist Johann Peter Heuschkel. On March 13, 1798, Weber's mother died of tuberculosis. That same year, Weber went to Salzburg, to study with Michael Haydn; and later to Munich, to study with the singer Johann Evangelist Wallishauser, (known as Valesi), and with the organist J.N. Kalcher. 1798 also saw Weber's first published work, six fughettas for piano, published in Leipzig. Other compositions of that period, amongst them a mass, and his first opera, Die Macht der Liebe und des Weins (The Power of Love and Wine), are lost, but a set of Variations for the Pianoforte was later lithographed by Weber himself, under the guidance of Alois Senefelder, the inventor of the process. In 1800, the family moved to Freiberg, in Saxony, where Weber, then 14 years old, wrote an opera called Das stumme Waldmädchen (The silent forest maiden), which was produced at the Freiberg theatre. It was later performed in Vienna, Prague, and St. Petersburg. Weber also began to write articles as a critic, e.g., in the Leipziger Neue Zeitung, 1801. In 1801, the family returned to Salzburg, where Weber resumed his studies with Michael Haydn, which he later continued in Vienna, with Abbé Vogler (Georg Joseph Vogler), founder of three important music schools (in Mannheim, Stockholm, and Darmstadt. 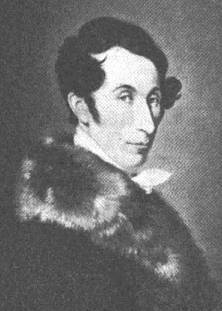 Another famous pupil of Vogler was Giacomo Meyerbeer, who became a close friend of Weber. Vogler, impressed by his pupil's obvious talent, recommended him to the post of Director at the Opera in Breslau (1806), and from 1807 to 1810, Weber held a post at the court of the Duke of Württemberg, in Stuttgart. While his personal life during this time remained irregular (he left his post in Breslau in a fit of frustration, was on one occasion arrested for debt and fraud and expelled from Württemberg, and was involved in various scandals), he remained successful as a composer, and also wrote a quantity of religious music, mainly for the Catholic mass. This however earned him the hostility of reformers working for the re-establishment of traditional chant in liturgy. In 1810, Weber visited several cities throughout Germany; from 1813 to 1816 he was director of the Opera in Prague; from 1816 to 1817 he worked in Berlin, and from 1817 onwards he was director of the prestigious Opera in Dresden, working hard to establish a German Opera, in reaction to the Italian Opera which had dominated the European music scene since the eighteenth century. The successful premiere of the opera Der Freischütz (June, 18, 1821, Berlin) led to performances all over Europe; it remains the only one of his operas still in the regular repertory. Weber's colorful harmonies and orchestration, the use of popular themes from central European folk music, and the gloomy (gothic) libretto, complete with an appearance of the Devil himself in a nocturnal forest, have all helped to ensure its popularity. 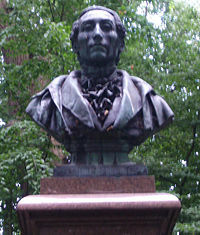 The bust of von Weber in Eutin. 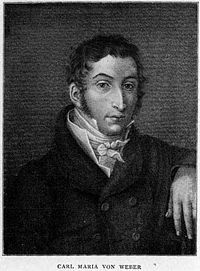 In 1823 Weber composed the opera Euryanthe to a mediocre libretto, but containing much rich music. In 1824 Weber received an invitation from Covent Garden, London, to compose and produce Oberon, an adaptation of William Shakespeare's A Midsummer Night's Dream. Weber accepted the invitation, and in 1826 he traveled to England, to finish the work and be present at the performance on the 12 April. Other famous works by Weber include two symphonies, a concertino and two concertos for clarinet, a quintet for clarinet and strings, and a concertino for horn (during which the performer is asked to simultaneously produce two notes by humming while playing—a technique known in brass playing as "polyphonics"). Weber was already suffering from tuberculosis when he visited London; he died there during the night of June, 4, 1826. He was buried in London, but 18 years later, his remains were transferred on an initiative of Richard Wagner and re-buried in Dresden. His unfinished opera Die Drei Pintos ('The Three Pintos') was originally given by Weber's widow to Meyerbeer for completion; it was eventually completed by Gustav Mahler who conducted the first performance in this form in Leipzig on January, 20, 1888. Weber was a great pianist and conductor. He had a greater knowledge of the orchestra than Schubert or Beethoven, even if, overall, he was a lesser composer than either. However, in the nineteenth century no one was far from the "Pollaca, Invitation, and Konzertstück, not to mention the 2nd Piano Sonata—a piece that requires a virtuoso. His music was more performance-oriented than that of Beethoven and especially that of Schubert, albeit intellectually not on the same level as either. Weber's piano music has all but disappeared from the stage but his orchestral music and his opera Der Freischutz, his most famous composition by far, are still performed. Meyer, Stephen C. Carl Maria von Weber and the search for a German opera. Bloomington, IN: Indiana University Press, 2003. Carl Maria von Weber cylinder recordings from the Cylinder Preservation and Digitization Project at the University of California, Santa Barbara Library. History of "Carl Maria von Weber"
This page was last modified on 11 January 2017, at 16:42.